A few years back it seems like every other review i wrote was raving about something or other from the Make Mine Music collective. It got to be a bit much even for me, so i took a step back from reviewing that label's output. Not that i stopped to listening to their string of high-quality releases, but rather that i no longer felt like i had to review every single one of them. I had made my point: Make Mine Music does fine work. But this – this is another masterpiece. Seriously. The In All the Empty Houses EP is six tracks in just under 30 minutes -- six intensely beautiful, powerful, and innovative tracks. This EP has blown me away each and every time that i have listened to it, and i simply feel that i have to rant about it here. But first, a little history. Epic45 is a two-piece act, consisting of lifelong chums Ben Holton and Rob Glover. They have helped out with several other MMM releases over the years, so you have seen these names mentioned before. 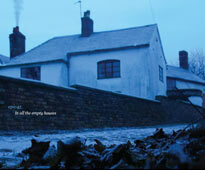 And of course, they released the lovely Hood-influenced England's Fallen Over EP back in 2005. Here they are joined by Simon Scott (aka, Televise; ex-Slowdive) on drums, and Paul Manasseh on keyboards. With this new four-piece act, they have crafted a lovely EP for our listening pleasure. Things kick off with We Were Never Here , which is a light song of strummed guitars in layers over vague clattering beats. The two vocalists sing counterpoint here, the voices entwining in a rather lovely fashion. The song builds to a frenzy in the middle, which subtle drumming and distorted guitars. Daylight Ghosts kicks off with a guitar echoed and some light drumming, over which one voice sings in a very English way. Eventually Scott drums along, and there is a low bass rumble and some keyboard drone. This is a good mid-tempoed shoegazery rocker of a tune. The next track is both the title track, and i think my favorite on this EP. It was also the Epic45 track on MakeMineMusic's 50th release. The rhythms here are a clattering electro dub beat, and the guitars are fuzzy in a lo-fi sense. To this there are soaring keys, and warbling sound that could very well be from a synth bass, or perhaps a regular bass played through some heavy echo. This is a spacey, groovy tune, and it never fails to get my head bopping. The Future Is Blinding starts with a low keyboard drone and a light tinkling of notes, almost like a Boards of Canada tune. This is just a brief interlude, as the guitars, voice, and drums come in shortly. There is an insistent bass riff, a thumping drum beat, and tinkling guitars. This is another dreamy shoegaze tune, with lots of layers of music sliding against each other. Epic45 give us an instrumental next, the light Their Voices In the Rafters. This is mostly a guitar drone and keyboards composition, with some light looped beats. Not their best tune, but it works in the flow of the EP. Finally we have Ghosts On Tape. This features a nice loping beat, some chiming guitars, the subtle voice, and a weird clattering noise. It took me a few listens, but i finally realized that the clattering is supposed to be the sounds of a ghost rattling its chains. Maybe that was obvious to other listeners, but at first it really threw me off. Anyway, there is some really lovely guitarwork here as well. I continue to be impressed. This is yet another very pleasant release from Epic45, and from the Make Mine Music collective.